CANTON, Mass. 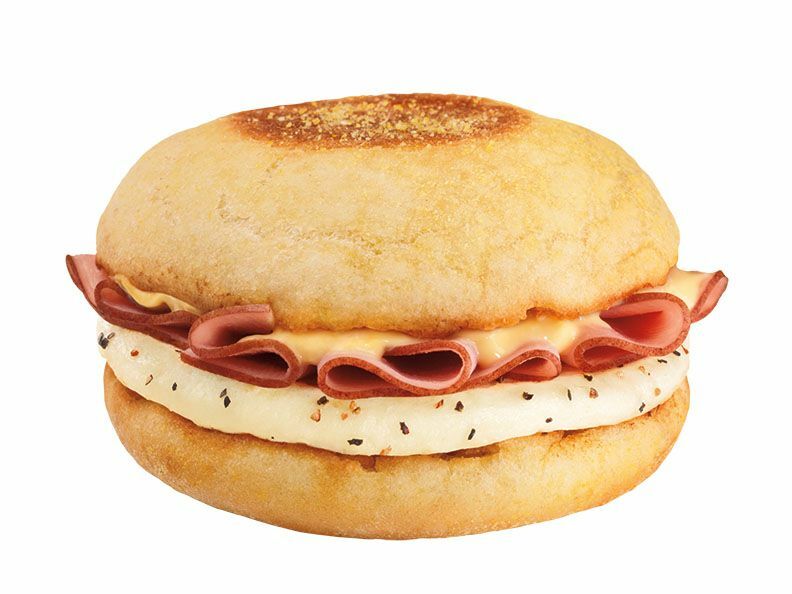 (March 3, 2014) -- Dunkin’ Donuts, America’s all-day, everyday stop for coffee and baked goods, is bringing a brunch favorite to its guests in a brand new way, today unveiling the Eggs Benedict Breakfast Sandwich. Offering a traditional sit-down breakfast and brunch classic served on-the-go, Dunkin’ Donuts’ Eggs Benedict Breakfast Sandwich features an egg, Black Forest ham and creamy Hollandaise flavored spread on an oven-toasted English Muffin. The Eggs Benedict Breakfast Sandwich is available all day at participating Dunkin’ Donuts restaurants nationwide for a limited time. During the first week of March (March 3 – 9), sales of Dunkin’ Donuts’ new Eggs Benedict Breakfast Sandwich will help make a difference in the fight to solve hunger across America. Dunkin’ Donuts and America’s Egg Farmers have partnered to donate one egg to Feeding America® for every Eggs Benedict Breakfast Sandwich sold (up to 750,000) between today and March 9. The eggs will be delivered to select local Feeding America member food banks throughout the country this Spring. The Dunkin’ Donuts & Baskin-Robbins Community Foundation has partnered with Feeding America since 2007 and has donated more than $1 million over the last five years to support Feeding America and its local food banks. Feeding America is the nation’s leading domestic hunger-relief charity, with more than 200 member food banks serving all 50 states, the District of Columbia and Puerto Rico. Feeding America’s food banks secure and distribute 3 billion pounds of donated food and grocery products annually through a network of approximately 61,000 food assistance agencies, such as food pantries, soup kitchens, emergency shelters and after-school programs. Thirty-seven million Americans receive food and groceries from Feeding America each year, including nearly 14 million children and 3 million senior citizens, and approximately 5.7 million Americans are fed by the Feeding America network every week. The Dunkin’ Donuts & Baskin-Robbins Community Foundation brings together a wide network of stakeholders, including franchisees, crew members and employees. The focus of the Foundation is to serve our neighborhoods by taking care of their basic needs – safety, hunger relief and children's health. To learn more about the Dunkin’ Donuts & Baskin-Robbins Community Foundation, please visit www.dunkinbrands.com/foundation. AEB connects America’s Egg Farmers with consumers, communicates the value of The incredible edible egg™ and receives funding from a national legislative checkoff on all egg production from companies with more than 75,000 hens in the continental United States. The Board consists of 18 members and 18 alternates from all regions of the country who are appointed by the Secretary of Agriculture. AEB is located in Park Ridge, Ill. Visit IncredibleEgg.org/Good-Egg-Project to learn where eggs come from and how you can help fight childhood hunger alongside America’s Egg Farmers.